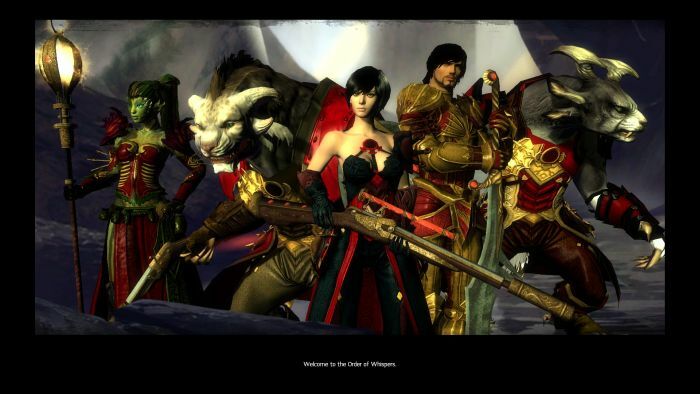 Welcome To the Order of Whispers #GW2 #GuildWars2 – Nomadic Gamers, eh! Almost level 35, and still completely enthralled with GW2. Of course, it hasn’t even been out a week yet, so that should be expected. I’ve still done hardly any adventuring, most of my experience is coming from crafting (the majority) with a few discovery bits thrown in. I decided that since I had “completed” Rata Sum, I would “complete” Lion’s Arch. That is to say obtain the vistas, points of interest, and gates. Today I plan on doing the same for Divinity’s Reach. When I reached 30 my personal story suddenly started getting a lot more interesting. I see how all of the races are going to meet up and what they’re going to mean to Tyria. I love that. There are still some major issues going on with the game. Number one, the auction house (trade post) still isn’t active yet. Despite this being an annoyance, I’m also pleased. I am leveling quite quickly, and if I were able to just purchase the materials I needed instead of having to actively go out and harvest them, I bet I’d level even faster. I don’t want that. Since you can also trade gems for gold and then use that gold to purchase items, it seems like once that trade post opens there may be a lot of folks keen to move up through the game via that method. More power to them, but I’m enjoying the fact that we all have to work together and talk and make new friends in order to trade goods at the moment. Yesterday I made a bargain with a few people I met in zone, my iron ore for their silver at a 3:1 ratio (because iron is quite plentiful). I even traded for some gems, and while you have to rely on the trust system because there’s no way to trade (you have to send things through the mail) it worked pretty well. Number two of course would have to be the security issues. A lot of friends are being hacked or getting emails stating that their passwords have been requested a change. I also got this email a few days ago, but haven’t had any issues with security. I have two NCSoft accounts, one is my master account (Aion, Lineage II etc), and then the other is for GW1/GW2. Both have different emails, and different passwords. Both of those emails have a two step authentication process (and different passwords), so if someone wants to get into my game account by requesting a password change, they’ll also have to get into my email account and bypass that. It’s not foolproof and I really hope ArenaNet adds more security options, but so far it has worked for me. I’m once more eternally grateful for KeePass, because there’s no way I’d be able to remember all these passwords otherwise. The third major issue I see is a combination of smaller bugs and glitches still kicking around in the game. Guild issues with joining and representing. To solve most of these I gate to a pvp battleground, for some reason guild stuff works better there. Overflow still has some glitches, as does meeting up with your friends to play together. These (imo) are relatively minor, and they haven’t affected my personal game play yet because I’ve been doing my own thing (aside from guild events). The combination of GW2 and WoW is working out well. One has a sub, one doesn’t. They’re both fantasy genre but I love fantasy so why not. Plus, there’s the amazing Combat Wombats, who I just can’t speak highly enough of. I hope everyone else has had as good a time in game as I have, and if not, I hope it gets better. As always, happy gaming, no matter where you find yourself!